Db2 12 for IBM z/OS® delivers several significant business values, such as cost reductions, scalability improvement, and improved application enablement for cloud and mobile environment. Db2 12 also introduces a foundation of continuous delivery. In continuous delivery, new capabilities and enhancements, including performance features, are delivered through function levels without waiting for a new release. Function levels 100 and 500 activate the initial set of enhancements and capabilities in Db2 12. For migration from Db2 11, most new capabilities become available in Db2 12 only after the activation of function level 500 or higher. In this IBM® Redbooks® publication, we focus on the enhancements that are available in function levels 100 and 500. Db2 12 for z/OS continues the trend by focusing on further CPU savings and performance improvement through innovations within Db2 and the synergy with IBM System z® hardware and software. While most of CPU reductions in analytical queries are built directly in Db2, other CPU and cost reductions are realized by using more real memory. Enhancements often take effect after the REBIND in the case of static applications, while some enhancements require user actions, such as activating function level, Data Definition Language (DDL) updates, or providing more memory for Db2 to use. 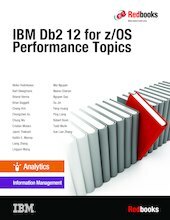 In this book, we describe the performance of Db2 12 for z/OS and the possible performance affects of the most important functions when migrating from Db2 11. We include performance measurements that were made in the Silicon Valley Laboratory and provide considerations and high-level estimates. Results are likely to vary because the conditions and work differ. For the purposes of this publication, we assume that you are somewhat familiar with Db2 12 for z/OS. For more information about the new functions, see IBM DB2 12 for z/OS Technical Overview, SG24-83833.